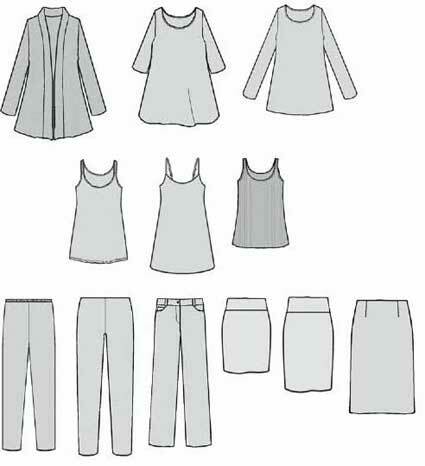 Here’s a possible basic group of co-ordinates : the whole ‘cheat sheet for getting dressed’ from Eileen Fisher’s Personal Shopper section for November to February 2011. My previous post suggested patterns for these. How could you build up to having a group of clothes like this ? (apart from making the whole thing rapidly in one Stitchers Guild SWAP :D). And how can you adapt it for yourself if this is not right for you ? If you’re just beginning to build a wardrobe of co-ordinates, you might start with the four items from Eileen Fisher’s early summer ‘system’ from last year (jacket, top, skirt, pants). – tops : 1 camisole top, 1 cap sleeved top, 2 long sleeved tops. 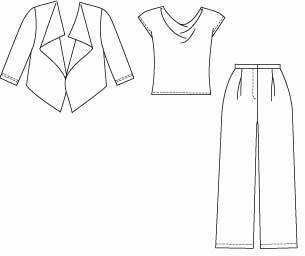 If you’ve already got the skirts, pants and sleeveless tops from previous groupings, then all you need to add are some (flared) long sleeved tops, and a warmer (banded collar) jacket. See my previous post for pattern suggestions. Once you’ve got the basics, she suggests changing the fabrics to have clothes that look professional, dressy, or casual, suitable for travel or your climate. How many items do you need for your minimum wardrobe ? To extend the wardrobe building idea, there’s Elizabeth’s plan of making 6 items each season. This builds up to a wardrobe of 24 items which co-ordinate throughout the year. This scheme is used in seasonal sewalongs at Stitchers Guild. This idea could make you focus on multi-purpose garments. 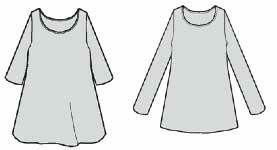 In her book “Sewing a Travel Wardrobe”, Kate Mathews describes a reversible top which can be worn inside out and back to front – and is made of 4 clearly different fabrics. I think the economic issues are a bit more complex than ‘owning only 6 items will save the world’. Modern economies depend on people buying things they don’t need. But it’s an interesting exercise. If you were only allowed to dress from 6 items (not counting under- and outer-wear), which clothes would you choose? And would 6 be the right number for you ? In winter I wear several layers together. I can imagine a month in mid-winter when I would wear all 6 items every day, just to keep warm. I don’t think that’s what’s intended with this idea 😀 You’re supposed to arrange things so people don’t notice you’re wearing the same things repeatedly. Perhaps 10 or 12 items would be a better minimum for me. 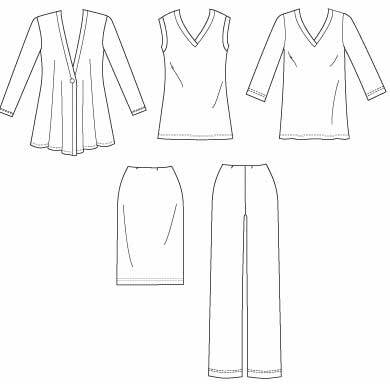 Early in my blogging I wrote about a tunic wardrobe and decided I need at least 10 items, 2 each of pants, shirt, thin sweater, thicker layer, vest. Then there’s my take on the Sewing Workshop layering wardrobe, which gets up to 8 items without duplicating function, 16 if you have two of each. Eileen Fisher uses very simple shapes, but her clothes are luxurious because of the quality fabrics. (I’m assuming of course that we all do quality workmanship so I don’t need to mention it 😀 ) And there are many ways of making the same styles look different by using different fabrics, see my post on Kate Mathews’ wardrobe plans. This approach to dressing uses simple basic shapes for bottoms and first layer tops. It’s the added over-layers which have more variety. In the Eileen Fisher capsules the jackets change the most each season. Of course the tops and bottoms are renewed in fabrics and details, but there’s not much change in the overall shape. Though it is a mistake to think a basic shell top must necessarily be boring. Have a look at Shirley Adams Alternatives 500 series pattern 501, which includes nearly 30 ways of varying a shell by adding embellishments and seams. 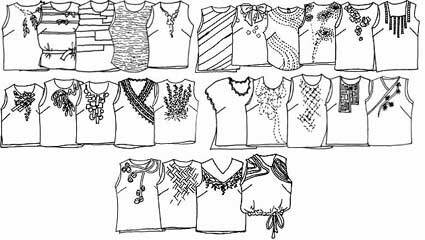 There are many other changes in another pattern, using different neckline shapes, collars, dart alterations, and wraps. 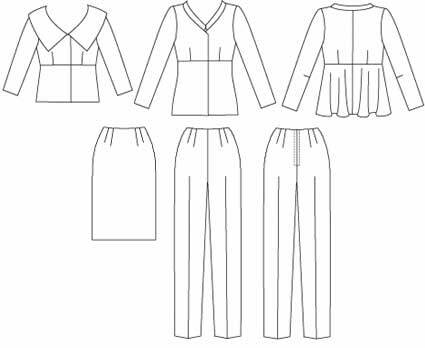 I talked a bit about using a small group of basic patterns to build a co-ordinated wardrobe, in my post on reducing the number of garment shapes. Although the jackets in the Eileen Fisher capsules do change in style each season, the previous season’s styles are current classics and not outdated. You can certainly continue to wear the cascade styles from Eileen Fisher’s early Summer 2010 capsule. WordPress recently told me what was most active in my blog during 2010. There’s that Butterick 5472 wardrobe with the cascade jacket I suggested for copying Eileen Fisher’s version. Out of all the patterns I’ve given links to, this is the pattern that the most people wanted to know more about. The more serious question is : does the Eileen Fisher capsule suit your needs ? your body shape, your lifestyle, your personal style ? What about the general types and numbers of each item ? Not much good for people who like dresses or jumper dresses. And I would have no use for so many skirts, while some people rarely wear pants. I’d like some vests instead, for more warmth ! (and for the same reason I rarely need a sleeveless top). People who need power dressing may prefer more jackets rather than tunic tops. What about the style elements of each item ? I use shirt-blouses for my first layer rather than sleeveless tops (there are a couple of soft shirts on the main Eileen Fisher site). And slim pants and short skirts are not good on me. Also in winter I want a jacket that fastens up to the neck, for warmth. Many people would not feel happy in the generally longer styles. People with waists might prefer their tops and jackets more fitted. People who are larger above the waist than below may not look good in flared styles. As I have a pear body shape, I need a bit of flare. But I need to be careful with styles which use flare as a style element, as I really need upper body emphasis. Power dressing is easiest with a more structured jacket (though I used to use the highest quality to achieve the same effect with an unstructured style). And many people like more structured styles anyway. What’s the core style for your most basic most useful wardrobe items ? Perhaps the last thing you enjoy wearing is plain tees, skirts and pants without any added style elements 😀 If you rarely wear jackets or added layers, you’ll want some of your tops and bottoms to be ‘statement pieces’. It’s certainly much easier to follow someone else’s capsule suggestion. If you’d like a similar group of co-ordinates though not Eileen Fisher styles, you have to find a way to cut down on the almost infinite possibilities. It’s an advantage of using independent patterns. The Big 4 try to cater for all tastes, which some people find confusing. It’s simpler to choose one pattern you really like, from an independent. Then pick the rest of the pattern group from the same designer. They’re likely to be in the same style. Choose patterns with potential for easy changes to sleeve and body length and neckline/ collar. I’ve already talked about some sources of independent patterns, both well established and more recent. Find a pattern you like. Get the pattern company name from the pattern envelope photo, and search for them so you can see their whole pattern line. Most pattern companies sell their patterns on-line now. Some of us would find it a relaxing relief to have a wardrobe devised for us. 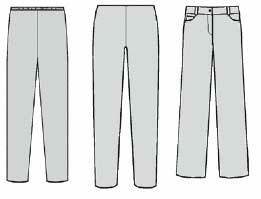 The Big4 pattern companies suggest wardrobe patterns. Most style books include wardrobe plans. For me they give pleasure and food for thought, though I’ve never wanted to follow one of them exactly. But by thinking how to change them so they suit me better, I learn about my own needs and likes. There are also many ideas for building a wardrobe of co-ordinates. The simplest is Endless Combinations. Just check that everything you make or buy goes with at least 2 items you already have, love wearing and find flattering. Despite knowing their limitations, I haven’t been able to resist suggesting several capsules with different styles. This all went on too long so that has become a separate post. . .
It’s the time for looking at the runway shows, and being reminded how little relevance they have for those of us who live happily without media attention or vast wealth. Exciting, fun, creative, beautiful – yes. But not much guidance about what to wear to do the shopping or in the office. So it’s good that there are stylish current patterns. I feel the same distance from the new dress patterns at Vogue and McCall’s. I’d be unlikely to wear these styles even as a wedding guest or for a special summer party, which I rarely go to. Vogue has a stunning group of designer dresses. 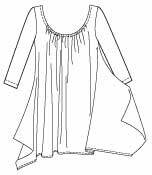 And McCall’s dress patterns have edgy trendy details. As I don’t wear them, I’m not the best person to comment on short barely-covered dresses. 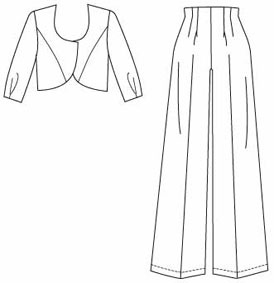 For people who don’t wear dresses but want to look ‘dressy’ : high waisted wide legged pants and boleros are ‘current’, as in Vogue 8717. Well, what if we just want to feel good when shopping ? Vogue 8710 has a couple of tees with added interest from Katherine Tilton. Vogue 8707 is a hook sided top. Many recent flared top patterns have this hook shaped side seam. The extra fabric swirls attractively as you move. But this draws attention to your hips. So I think this for people who want to look as if they’ve got more hips, not for those who’ve already got too much. . .
Or for a fitted sleeve there’s McCall’s 6285. 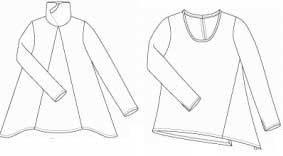 Though who on earth decided a yoke, top-stitched princess seams, band collar and curved hem are Easy ! What an effective way to distress beginners. Vogue 8712 (left) is a pant pattern from Marcy Tilton. A wide legged style that tapers rapidly at the ankle just makes me look dumpy, though I know many people love it. Also many people like this Vogue 8711 draped skirt (right). Sadly it’s only for people can show off less bulgy hips, a flatter stomach and prettier knees than mine ! It’s a good season for people who like shirt jackets. Vogue 8716 (left) has a high collar, fitted sleeves, and yokes with gathers. All flattering style elements for me. Vogue 8708 (right) is another big shirt, but the flat collar and cut on sleeves aren’t best for me. I expect there are many people with different bodies from mine who will prefer this one. Shirt and pants in the same fabric (or print) is current. For another way of adding a layer, there are some interesting vests in Vogue 8713. And for trendy knit layers there’’s McCall’s 6288 by Rebecca Turbow. Two summary points about jackets in the collections. 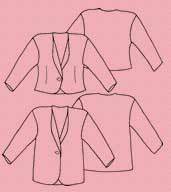 One is there are many collarless jackets, perhaps worn with collared tops. Nearly all the current wardrobe patterns have collared jackets over collarless tops. That doesn’t work well for me. With my long head and neck, I like a raised neckline whether or not I have a jacket on. So I’m pleased to see collarless over collared coming back. Vogue has a couple of ‘peplum’ jackets in their Custom Fit range. Good opportunities for fitting the top. Vogue 8714 has front princess seams and pattern pieces for 4 cup sizes. A waist level seam makes it easier to fit my bigger lower half with high hips. Though I need darts in a peplum, or it would just stick straight out from my waist. And this pattern has back shoulder darts and a CB seam. So the first steps have been done if you need back shaping alterations. Vogue 8715 is a peplum jacket wardrobe with similar fitting help. 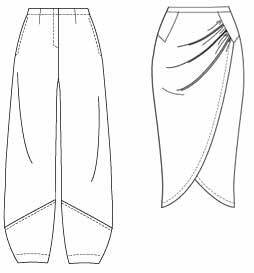 This time with above waist seam. And those are the best style of pants for me ! Although some high seams look good on me, I would need several fish-eye darts to get the lower front portion of this jacket to fit well over my indented waist moving out rapidly to high hips. The previous jacket looks easier to fit for my particular shape. The second key point about jackets this season is that most are blazers. Many patterns already available. If you prefer something more structured and closely fitted, there’s a trendy slim shape by Melissa Watson for Palmer-Pletsch, McCall’s 6294. And I’m a sucker for pieced jackets. There’s a new one from Nancy Zieman, McCall’s 6293. You have a choice between narrow or wide lapels on your blazer. Double breasted nearly shoulder-wide lapel ‘trench’ style is current in dresses, jackets and coats. There’s a jacket in Simplicity 2256. 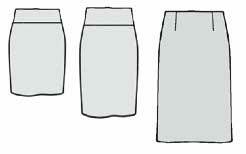 High waist seam again, but this time with fitting seams below, so usable by a wider range of body types. So there are plenty of arty/ classic/ relaxed/ soft/ trendy options for looking good this season. There are more patterns I want to comment on but this got too long. Colours : McCall’s go for strong pink, denim blue, slightly yellowed green, and rust-tan neutrals. Pantone also mention silvered palest pink and mid grey as neutrals. Does that cater for Winter, Summer, Spring, Autumn colourings, and the grey haired ? Has the Stitchers’ Guild jackets sew along made it onto your list of Resolutions ? Most people who hear the word ‘jacket’ immediately assume lengthy hours of advanced sewing skills are essential. Well, there are sewers who can make a tailored/ structured jacket in a month. And good for them. 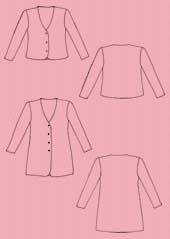 But many jacket patterns don’t involve tailoring. They’re ‘dressmaker’ styles with no lining which need little more skill than making a top – often much less skill than making a shirt with band collar and proper sleeve placket. As my fabric stash consists mainly of miles of quilting cottons, I need to make casual jackets and shirt-jackets to use some of it up ! So, what about making some jackets really quickly ? 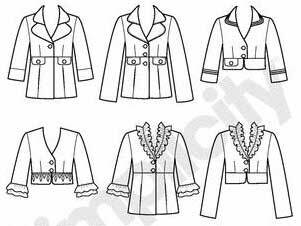 I’ve already listed the Big 4 speedy jacket patterns which claim to take only a couple of hours sewing time. Three patterns for knits. 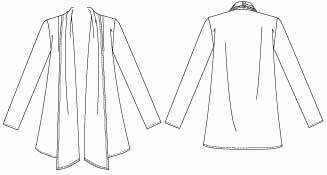 For wovens, there are jackets all the way from casual cascade to formal notched collar. Even two quick outerwear jackets. 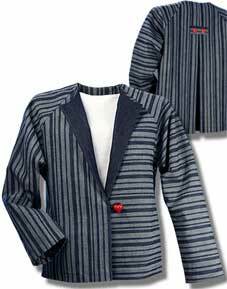 Since that post, McCall’s have added another 1-hour knit jackets pattern – McCall’s 6208. There are also a few jackets among the speedy wardrobe patterns..
Make all those, to get you well on the way to a dozen jackets. What about patterns from independent designers ? They rarely claim how long their patterns take to sew, but there are a few. Textile Studio often do give sewing times for their simple stylish patterns. There are a couple of jackets (originally designed by Loes Hinse). Capri jacket : 2-1/2 hours sewing time. 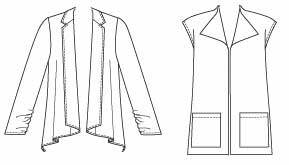 Shawl Collar jacket – also 2-1/2 hours. I have the Florence jacket, said to take 2 hours to sew. Discontinued but still available from The Sewing Place. CNT patterns also have a couple of timed jacket patterns. And they say their ‘A Little Somethin’ jacket’ no. 2501 is a 3-hour project. Slightly dropped shoulders, shawl collar. 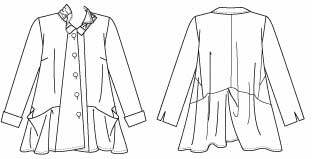 Silhouette patterns don’t give specific sewing times on their site, but the instructions often suggest how many sessions you need. I have one quick one – no. 85 Sweater Wrap says it can be made in one session. There are some minimal DIY patterns available online. I’ve decided in general not to review online patterns. But I can’t resist mentioning this one. Watch Shirley Adams show how to make a jacket without using a pattern at all, and only 2 seams – in her Bog coat video. 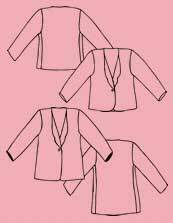 Make a fleece jacket in 10 minutes. MacPhee Workshop patterns don’t give specific sewing times, but her patterns focus on quick techniques. 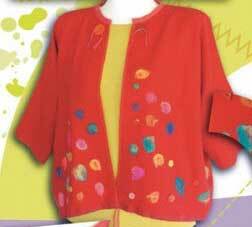 In particular, there are several jackets in the ‘It’s Magic’ section which have only one pattern piece. Her ‘Magic Coat’ no. 150 is a tidied-up version of the bog-coat. As is no. 154, ‘Night and Day’. There’s also the ‘World’s Easiest Parka’ with 2 pattern pieces, in the Coats and Jackets section. I would refer to these patterns more often, but the diagrams are so tiny they aren’t worth reproducing. There are other Big 4 patterns which aren’t quite so quick, but don’t require complex skills. Though beware that most Very Easy Vogue patterns would be ranked Intermediate in difficulty by other people ! Or the Vogue jackets section. There are more than a dozen labelled ‘Very Easy Vogue’. And there are about a dozen more jackets in the Very Easy Vogue Separates section. What about going the other way and advancing your skills, but still on relatively quick projects. Perhaps working toward ultimate jacket making skills by doing some tailoring. For quick tailoring, there’s the McCall’s 6172 Palmer-Pletsch blazer pattern, supported by the Palmer-Alto book ‘Jackets for Real People’. (P.S. There’s now also a DVD, Jackets for Real People.) This jacket is interfaced with fusibles. They claim it takes 8 hours sewing time (after practice !). Three lengths so you can get it right for your own proportions. 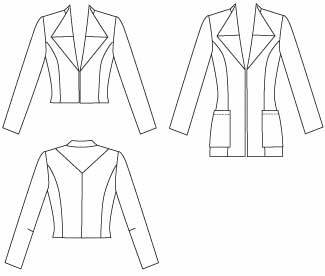 These are just a few examples of what you could do if you want to go a more complex, though still quite quick, jacket making route. 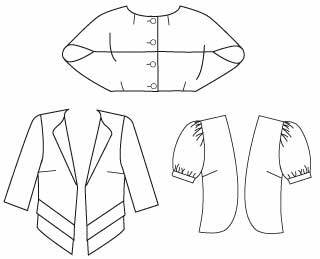 But there are so many quick and easy patterns, there’s no need to despair that you need to improve your sewing skills and take lots of time if you want to make several jackets in one year. 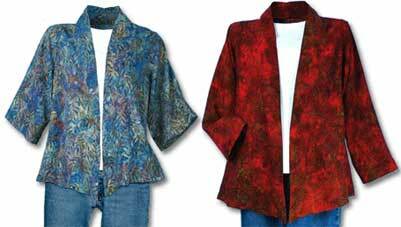 And you have only got to make one jacket in the year to join the sew-along !